​We met Cyrus Kibuchi on a Monday morning at Kamangu, a town 40 km from Nairobi. Cyrus works as an agent in Kamangu, and days like this usually find him busy at work. He is an agent who serves seven digital financial services (DFS) providers. These providers comprise five banks and two mobile money operators (MMOs). Our interview is interrupted thrice in 25 minutes as Cyrus attends to his customers. A majority of his customers are from the locality. On Monday mornings like this, most transactions are deposits or cash-ins. Members of savings groups come to deposit their contribution in the group account from their business earnings over the weekend. Church representatives come to deposit Sunday offerings collected from worshippers. Farmers walk in to either withdraw or deposit their income from the weekend. Suddenly, Cyrus informs us that the receipt roll in the POS device is about to run out, which means he cannot continue transactions until he gets a new roll from the provider. He does not seem worried by this and continues his business as usual. We ask him what will happen once he runs out of the roll. He responds, “I have already placed my request for a new roll in the bank’s WhatsApp group. A fellow agent has replied that he has an extra roll that he can lend me. I will also receive a new roll from a bank staff in the afternoon. I have sent my son to pick one up on my behalf from the agent. WhatsApp has really simplified my life as an agent.” Cyrus goes on to say that he would have otherwise had to wait for the bank staff to come to his shop or he would have travel to the nearest branch. “This would cost KES 120 (approximately USD 1.2) for transport. Loss of business is an additional expense that is difficult to calculate,” he says. 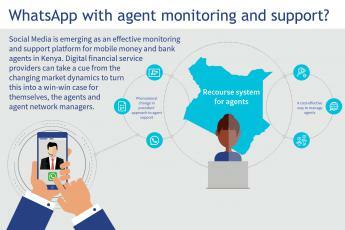 Cyrus’ story highlights the importance of effective and responsive agent network management especially to monitor and support agents in order to optimise customer experience and thus increase uptake and usage of DFS. In 2015, a MicroSave study for Consultative Group to Assist the Poor (CGAP) revealed that factors that impede customer usage of DFS are primarily related to hygiene in the agent network – most of which could be fixed with agent monitoring and support. In 2017 alone, DFS providers reported having spent over half of their revenues on commissions and agent network management. A comparative analysis of data from Wave I and Wave II of our Agent Network Accelerator (ANA) survey in Kenya further revealed that providers’ visits to agents had dropped by 15% between 2013 and 2014 This is intriguing, especially since the reduction in agent visits happened amid a surge in competition from banks. However, conducting these visits is expensive since they are intensive in terms of labour, capital, and time. Some providers may choose to reduce the visits and assume that other providers are monitoring the agents in non-exclusive agent networks. For agents who provide services to multiple providers, a mutual collaboration between providers on agent monitoring may result in standardised monitoring and cost optimisation. A follow-up qualitative study on agents dubbed ‘Agent Diaries revealed, in part, the cause of this drop in agent monitoring. We commissioned the study to deepen our understanding of quantitative insights into agent networks derived from the ANA studies in four years. ‘Agent Diaries’ involved shadowing a panel of 10 agents in Kenya on a regular basis and conducting regular, in-depth, qualitative interviews with agents over six months. We will disseminate the findings across a number of blogs – this being the first in the series. In Kenya, providers have been increasingly engaging agents through social media forums to monitor and support them. Interestingly, WhatsApp groups have emerged as the most popular platform for agent monitoring and support. This trend appears to be common among almost all providers – banks and mobile money operators (MMOs). However, banks seem more inclined to support agents remotely through WhatsApp groups compared to MMOs. This could probably be because banks mostly manage their agent network from the branches. They are thus likely to have smaller and dedicated in-house field support staff compared to MMOs, who typically have robust human capital to manage their vast airtime distribution network. How do WhatsApp groups facilitate agent support? WhatsApp groups act as information hubs for agents and agent managers. Providers create these groups for agents and field staff from a particular territory. The provider’s field staff function as group admins to ensure the chat conversations remain relevant to the purpose of the group.The group provides agents with a forum to share experiences of their day-to-day operations and seek solutions to business challenges that include liquidity, emergent fraud, and support required. Members also communicate new developments including products, commission structures, and system downtime within the group. “I am a member of five different WhatsApp groups from the five providers that I serve. Through these groups, I am able to get alerts on a threat such as a conman who is defrauding unsuspecting agents. Sometimes agents with a surplus of float or hard cash at a particular time communicate in the group and connect with other agents in need of the same.”– Cyrus Kibuchi, an agent in Kamangu town. Agents can post any issue they face on the group by either addressing it to the provider’s staff or to other agents. cial institutions, agents are grateful to receive assistance from either their supervisors or other agents instantly. What is in it for providers? A number of providers are investing less in physically visiting the agents. They are thus able to compensate for this by engaging agents in WhatsApp group forums where they support them on a real-time basis. The WhatsApp groups unite agents and also give them an easier way to interact with their respective provider’s field staff and also with other agents frequently. “My support staff do not have to be constantly in the field paying agents visits. They can engage them in real-time through the WhatsApp group. The time saved from not having to visit agents physically helps the staff contribute productively to the organisation.” – Head of Agent Banking for one of the leading banks in Kenya. Complaints and dispute resolution systems for agents remain challenging and are a constant area for improvement for most DFS providers. Our ANA studies from Kenya and ten other countries reveal that agents consider dealing with call centres only when something goes seriously wrong. A senior staff in the agent banking department of a leading bank in Kenya attributed this challenge to a lack of dedicated support staff and insufficient investment by banks that could support agent banking channels. For example, most banks lack a toll-free agent care line dedicated to agents. However, WhatsApp has been acting as the workaround that provides an instant and cost-effective way to communicate with bank gents and resolve disputes. Making use of technology to offer support is critical in the roll-out of new products or for fine-tuning product features. Agents reported finding value in WhatsApp updates compared to refresher training when seeking clarity on product details and transaction mechanics. The real-time communication enables the agents to understand new product features without having to close their businesses to attend the training. “When the bank introduces a new product or fine-tunes a product, I am expected to notify all agents in my territory and also train them. The first thing I do is post on the WhatsApp group of agents in my territory. If the change affects the mechanics of transaction on the agent till, then I offer a step-by-step guide on how to conduct transactions with the new change through WhatsApp.” – Agent Network Manager, Branch level. As most DFS markets mature and competition increases, providers have increasingly taken a back seat on agent support visits. This could be because of the proliferation of non-exclusivity, meaning agents could receive support from more than one provider. While leveraging social media as a support tool could be a cheaper and more efficient way that takes advantage of technology to support agents, it does not work for agents who do not have smartphones. However, our studies prove the importance of in-person monitoring and support as the agents feel a sense of belonging to the provider’s brand and perform better, a sentiment echoed by a panel of agents who were interviewed. Social media may not effectively replace the official communication channels, but providers should seek ways to incorporate its attributes to support their agents and consequently provide better service to their customers. There are already some premium solutions, such as Ongair that incorporate social media management for corporate institutions. Social media group administrators could constantly monitor and review conversations, including verifying advice and solutions that agents may share with each other on the platform. It is also imperative that all the group participants be aware that they are sharing their business information on a relatively open forum and should practice caution in handling their own data and that of customers. Please tune in for our upcoming blogs that highlight liquidity management and agent profitability from our agent panel studies.